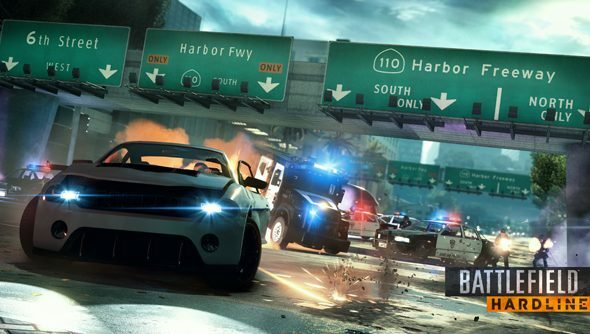 Underlying widespread disappointment with the ongoing Battlefield Hardline beta is a sense that Visceral haven’t made the most of their cops and robbers conceit. The game’s urban US locations are in perma-Heat, constantly in the throes of what can only be described as domestic military operations. The developers have countered that by reducing the amount of heavy explosive weaponry to hand. And they’ve taken some superficial steps to tackle Hardline’s resemblance to its proper military predecessor, Battlefield 4. As such, Visceral have reduced the frequency of boomsticks around their maps, and feel they’ve made the use of explosives “much more believable”. The tinkersome Mechanic class retained its capacity for turning cars into bombs, despite recent rebalancing. But an increase to the armour of weaker transport vehicles should also help to minimise the number of fireballs per minute. “We agree that one magazine from the AKM should probably not turn your sedan into a 4-person death trap quite so easily,” said Sasser. For planned changes to audio, medkits and interrogation, see Visceral’s community most wanted list. Visceral have made tweaks to both their Heist and Blood Money modes to ensure rounds last a little longer, granting the game its own pace. Beyond that, they’re working on distinguishing the in-game HUD from that of Battlefield 4. Will it be enough? Or do Visceral need to be prepared to dig beneath the skin to distinguish their game from DICE’s?